← April Week 1 – Connected to the ground (past and future). What do these images have to do with my comments? That may still be your question at the end of these paragraphs. Today silence and absolute calm converged on Boston as a time of remembrance was observed at the marathon finish line on Boylston Street. One year ago today (April 15) two pressure cooker bombs exploded, killing three people and injuring an estimated 264 others. As a tribute to the recovery from last year’s terror attack, next Monday’s Boston Marathon will host the second largest number of runners in its history. At the very moment this news was breaking last year I was riding in a funeral procession with my brothers and their families to bury our father. None of us asked why the funeral director suggested we not turn the radio on until after the interment. Obviously, in his wisdom, we were spared the grief and agony of others so that we could have our moment of family mourning. Sometimes it is important to stay focused on one’s personal experience and attend to the greater picture, the needs of the world, later. Perhaps we can actually be more compassionate and open to other situations having cared for our own first. Self-care and self-reflection are anything but selfish. Watching a snail slowly creating its slimy pathway across a well-traveled sidewalk re-taught me this lesson. My favorite images from last week are my attempts to capture the kind of single-focused stillness that reveals a deeper purpose. The Great Blue Heron stands statuesque, and, in its movement, is graceful. It is one of North America’s most familiar wading birds and very adaptable to different environments. At four feet tall, with a six-foot wingspan, it is also the continent’s largest heron species. 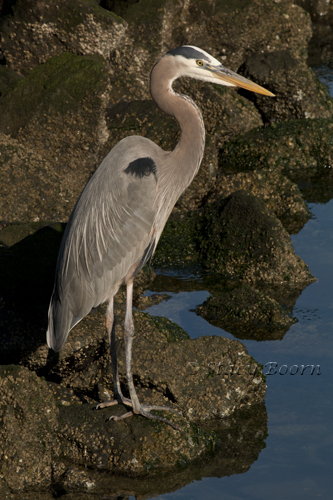 While vocal in flight, Great Blue Herons are frequently observed standing silent and motionless along shorelines. Standing silent and motionless is an applicable spiritual posture for this week we call holy, a time of focusing on the life-work and words of Jesus that led him to the cross. “Incarnate, you have redeemed me; dying, you have awakened me. Now you have brought all your works to fullness – in virgin nature you found pasture, in virgin nature you assumed flesh.” – Hildegard of Bingen. What do these images have to do with my comments? That may still be your question! 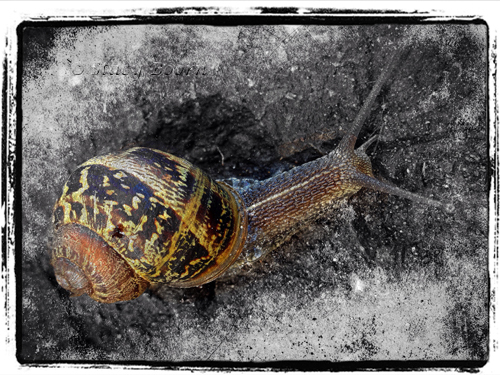 This entry was posted in Weekly 2 and tagged Boston Marathon, Great Blue Heron, Holy Week, Nature Photography, Snail, Stacy Boorn. Bookmark the permalink.